After 18 years of membership and ministry at Christian Life Church , Baltimore, MD, under the pastorate of the late Rev. J. Luther Carroll, in the 1990’s, like Abraham, Pastors E and B began sensing a compelling urge of the Holy Spirit to “do a new thing.” As the years progressed, God implanted in their spirit the details of the vision and mission He intended for them to pursue. Through much prayer and fasting and encouragement and support of the saints, a series of weekly prayer meetings began unfolding on Sunday evenings in their daycare center, Maranatha Christian Daycare and Learning Center, located at 3523 Ellen Road, Baltimore, MD. 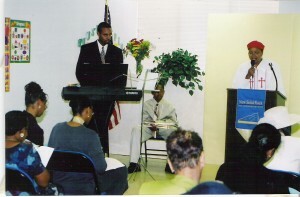 These prayer meetings led to the organizational meeting held on September 7, 2002. FURTHER RESOLVED, That Evangelist Ernest M. Sewell and Evangelist Brenda J. Sewell be appointed and serve as founding Pastors of New Solid Rock Fellowship Church, Baltimore, Maryland. Our first church service was held on Sunday, October 6, 2002 in a classroom at 3523 Ellen Road. We started with humble beginnings. Over the years God has blessed us mightily. He has enabled us to make a spiritual impact both locally and internationally. He has added faithful and committed covenant keepers to the fold. 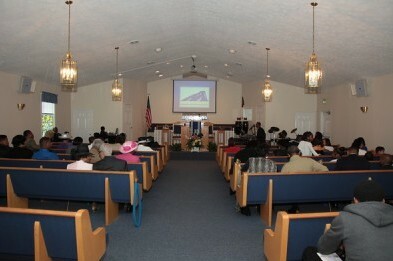 In 2004 God made provision for us to complete extensive renovations on Ellen Road and we held our first service in our renovated sanctuary there on August 29, 2004. On April 5th of 2011, God enabled us to purchase our current property at 4003 W. Northern Parkway, Baltimore, MD, which we dedicated on Easter Sunday, April 24, 2011. 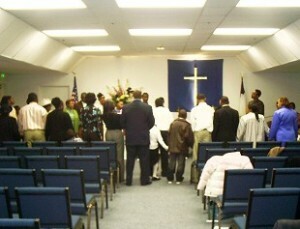 On Sunday, August 14, 2011, Rev. Terrye Ashby Moore (Ordained Minister 2005) was consecrated to the Office of Pastoral Ministry and appointed Assistant Pastor. Rev. Moore was installed as Senior Pastor of New Solid Rock Fellowship Church during the Church and Pastors’ 15th Anniversary Service on Sunday, October 1, 2017, which was also celebrated with the burning of the church’s mortgage. We thank God for the souls saved, the miracles witnessed, and the promises kept. We look forward to the greater harvest ahead and to faithful service in God’s Vineyard until the day of Jesus Christ.